Imagine Dragons, M.A.D., Ellie Goulding, Stevie Wonder, Earth, wind & Fire and more. First broadcast Saturday 1 March 2014 on Chelmsford Community Radio. 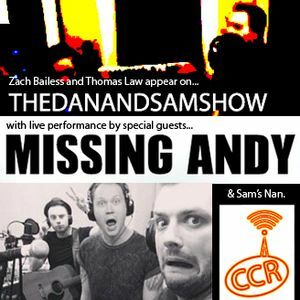 Dan & Sam welcome Zach Bailess in the the studio, and Thomas Law on the phone. Missing Andy perform live in the studio. Features include music, games, pranks, Sam&apos;s Nan, and the usual friendly rivalry with CCR&apos;s Emily Drivetime.